Technology is changing industries throughout the world, revolutionizing the way that business is conducted in ways that would have seemed unimaginable just a few years ago. Businesses are now applying advancements in technology to electronic funds disbursement, making life better for both for payers and for payees by eliminating the need for paper checks. Electronic disbursement provides a higher level of control to the payee, who can decide between a number of different types of payments. Payees can disburse funds to a single account or multiple accounts, that are either traditional bank accounts or to prepaid cards untied to any account. Funds can be transferred by ACH, or by push payments through a service like Venmo or PayPal. Disbursement decisions can be updated at the payee’s discretion, accessed and controlled through web portals, mobile devices, or IVR. Payees receive money faster through electronic disbursement as well, providing another level of control and discretion for receivers. Payments do not need to be interrupted for weekends or holidays when banks close, and mail is delayed. Electronic funds disbursement is beneficial for payers as well. Printing, distributing and mailing paper checks is an expensive, time-consuming process. Managing the regulatory requirements and compliance activities that the government connects to payroll activities is complicated. Finally, if payees are not in control of their own disbursements, they will look to the payer to change, update, and manage a variety of transfers, exchanges, and requests, taking your employee’s valuable time and resources. With paper checks, businesses are responsible for obtaining and maintaining sensitive bank information, and keeping it secure. Payments that businesses transfer electronically are not only cost-effective, but they are also highly secure. Signatures and approvals can be managed electronically to streamline payroll processes. TransCard also allows payers to combine payments with other essential documents and digital signatures to streamline payment processes and to make compliance even more manageable. For example, remittance information can be attached to the payments, along with corporate contact information and up to 10 customizable fields that can be configured for searching and filtering data. Provide innovative customer service-based solutions for employees. Regular payroll, incentive and promotional payments and more can be made quickly and automatically, controlled by the receiver of the funds themselves. 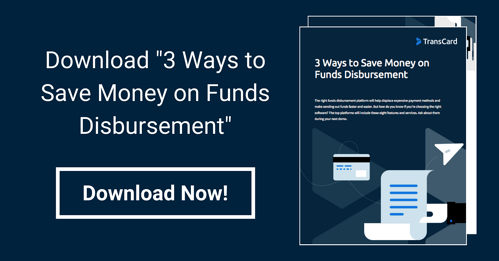 Managing funds disbursement through an electronic payments platform reduces the time and resources that companies must devote to these activities. Processes can be automated in many cases, and businesses are no longer responsible for maintaining confidential employee banking information. Reporting and compliance requirements, including transaction reconciliation, taxes, and other reporting and compliance activities are contained within the system and can be quickly and seamlessly updated and maintained.